Barter Books : Bullock, Christine; Morgan, Kemi : The Making of Good Wives, Good Mothers .. Leading Lights of Society. 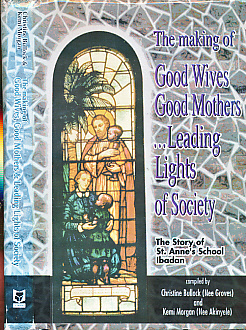 The Story of St Anne's School, Ibadan. 230 x 160 mm (9 x 6 inches) - viii, 208pp. VG: in very good condition with dust jacket. Previous owner's inscription.